Keep utensils, serving dishes or trays from bumping into one another as you open and close drawers with the felt liner. This liner also helps prevent scratching on the inside of your drawers, allowing the piece to look newer longer. Silverware and other precious items can also be kept safe and organized in felt-lined drawers. Create a more custom experience with the ability to store your items in sizes that are specific to them. Smaller fragile items need a smaller space to eliminate movement and maximize your storage capacity. Give serving trays and large dishes a proper place in your dining room instead of scattered around your house wherever you have room. Use adjustable shelving to help create a tidy and convenient storage space for all your dining needs. Panel doors and carved details make this buffet a great focal point for storage and display in your kitchen or formal dining room. 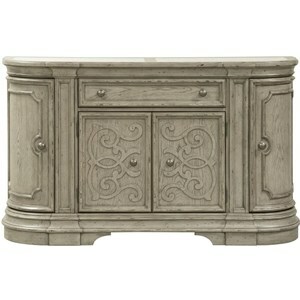 Three felt lined drawers in this sideboard buffet offer plenty of organizational options. The buffet also includes an open top for serving food or display. The adjustable shelves within the wood doors will hold plates, bowls, tablecloths, and more. The Treasures 2 Door Dining Buffet by Liberty Furniture at Thornton Furniture in the Bowling Green, Alvaton, Glasgow, Scottsville, Franklin area. Product availability may vary. Contact us for the most current availability on this product. Finish Rustic oak finish and black finish. Case Detail Solid wood legs. Sheaf back side chairs. Drawer / Shelf Construction French and English Dovetail Construction on select items. Case Construction Constructed from select hardwoods and ash veneers. Treasures Dining Collection represents one of the largest collection of choice in style and variety. Choose from the styles available for dining in a formal or casual setting with a variety of chairs, tables, and finishes. Coordinating dining storage and display pieces as well as living room occasional tables offer rustic style with a country flair for your home. All pieces are made of select hardwood and natural veneers completed with select items available in Rustic Oak and Rustic Black finishes that are easy to mix-and-match. The Treasures collection is a great option if you are looking for Casual furniture in the Bowling Green, Alvaton, Glasgow, Scottsville, Franklin area. Browse other items in the Treasures collection from Thornton Furniture in the Bowling Green, Alvaton, Glasgow, Scottsville, Franklin area.